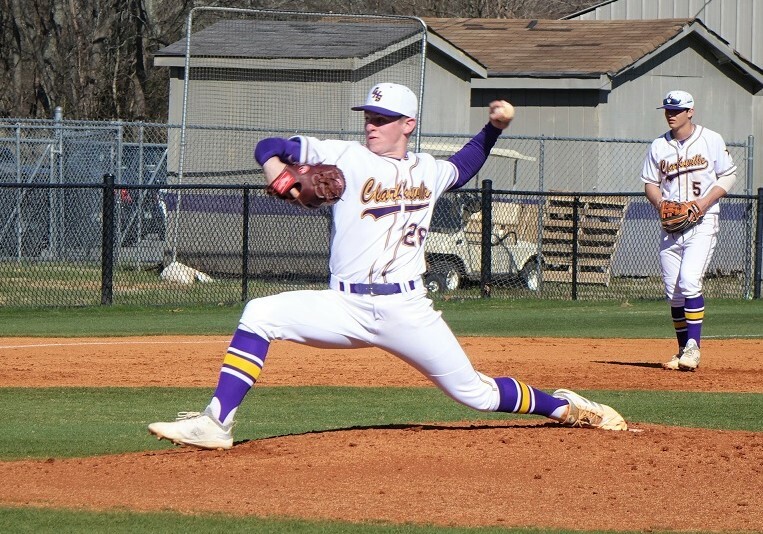 CLARKSVILLE, Tenn. – Clarksville High’s 5-2 District 10-AAA win over Henry County quickly became the Nick James show. The North Carolina commit had 17 strikeouts as the Wildcats kept Henry County silent Tuesday. James gave up one hit and two walks and struck out 17 of 23 at batters on 118 pitches. At the plate, James powered a two-run home run well over the left field wall to give the Wildcats a 3-0 lead in the bottom of the second. “I saw a fastball kind of elevated and I just put a good swing on it,” James said. While James and the Wildcats put the ball into play, Henry County struggled from the start against the Wildcats’ senior left-hander. James had five strikeouts through the first two innings. James showed his calmness on the mound by working a 3-0 count against Ethan Thompson in the top of the first into a strikeout. “It was huge,” Hetland said. “If he walks a guy there then we are using our bullpen (due to pitch count). Nick is a horse, and he is a machine. In the bottom of the third, Steffen Brooks put himself in position to extend the lead with a triple before being brought in off a Noah Gallagher sacrifice fly. Brooks’ triple served as one of five extra base hits for the Wildcats, while Hetland’s team totaled seven hits. Hetland was also quick to credit catcher Dylan Walker’s tandem with James. “Walker was fabulous behind the plate for us,” Hetland said. “He really stepped up, and Nick James is not an easy guy to catch, so I am really proud of him tonight. With the win, Clarksville High moved to 14-4 and 9-0 in league play.